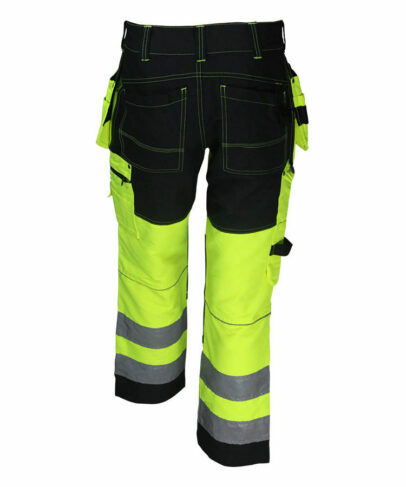 This hi vis yellow + black pants made of 260gsm 65% polyester 35% cotton hi vis fabric, and can meet EN ISO 20471, ANSI/ISEA 107-2015 and other standards. 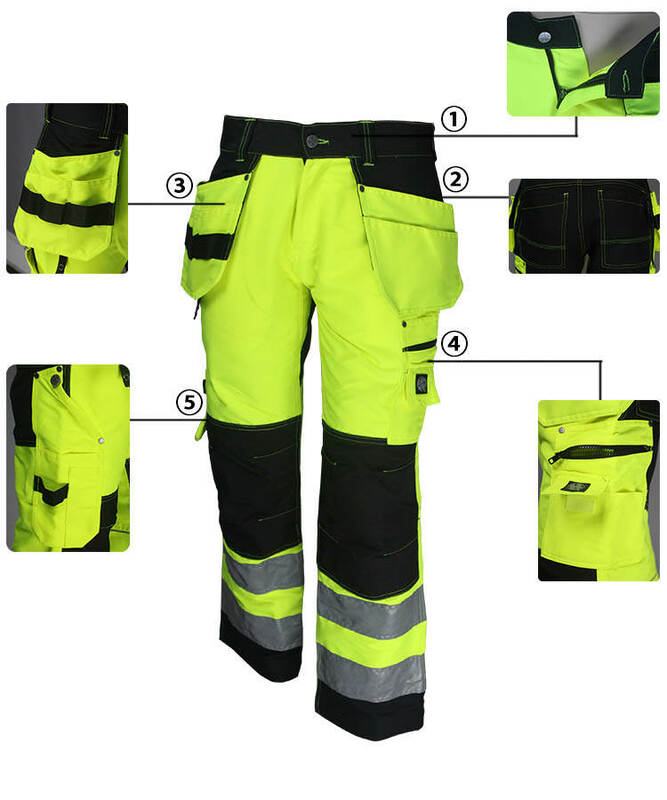 The hi vis pants can make the wearer be identified more easier than the surrounding things in poor light and short distance, thus to ensure the safety of the wearer. 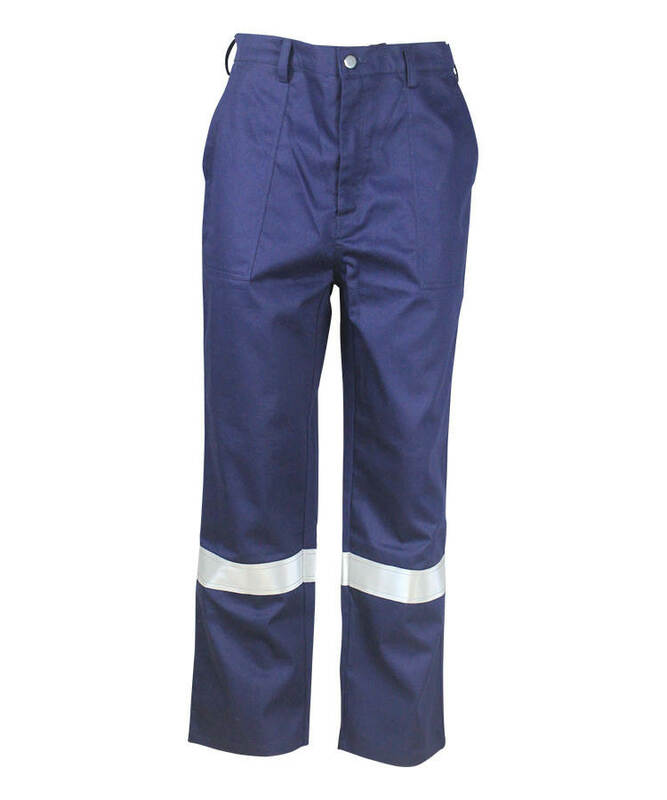 This hi vis pants is highly breathable and that a comfortable temperature is maintained at all times. 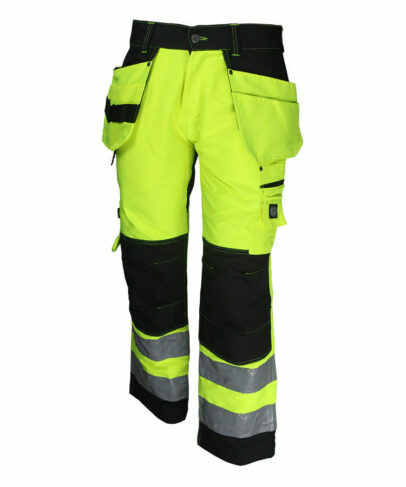 This hi vis yellow + black pants mostly used for policeman uniform, railway uniform, or produce offshore garment and oil gas. Front fly single surface line, closed by metal zipper. Hip patch pocket, bottom double layer. Outside left and right pocket, there is a contrast color tool punching pocket, punching pocket is two in one polygonal punching pocket,upside of pocket opening fixed with rivet. Outside right hanging pockets there is bride tool loop, convenient for tools hanging. On the back there is a woven tape loop, closed by five claw button, can hang working card. Left pants there is a three in one half activity patch pocket, upside slang pocket closed by zipper, down side small pocket there is a flap closed by velcro, an open pocket can put tools, semi activity two angle fixed with rivet. 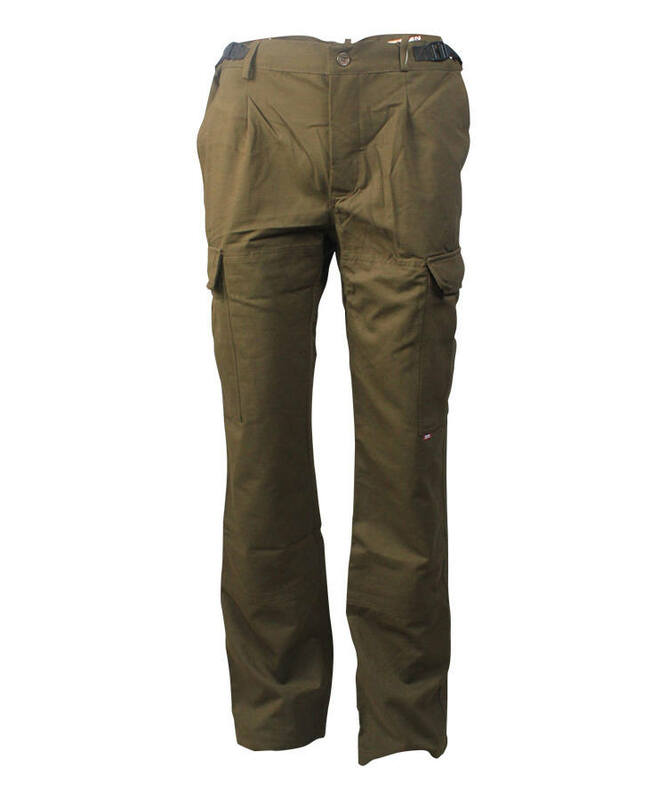 On the right pant there is a three in one semi activity tool pocket, top pockets three point fixed with 3 rivets, outside there is a 2.5cm width woven tape used as tool loop, below the middle rivet, there is a jeans button, can hang on goods. Two reflective tape on the leg, all the thread of surface line of hi vis yellow + black pants is in hi vis yellow color. The hi vis yellow + black pants pocket is corner pocket, double surface line in pocket opening, inside of right pocket there is a small pocket. Front legs two colors matching, padding on the keen, pleat, increase the range of activity in the knee, to make worker more comfortable during work, and padding make this hi vis yellow + black pants durable and anti-abrasion. 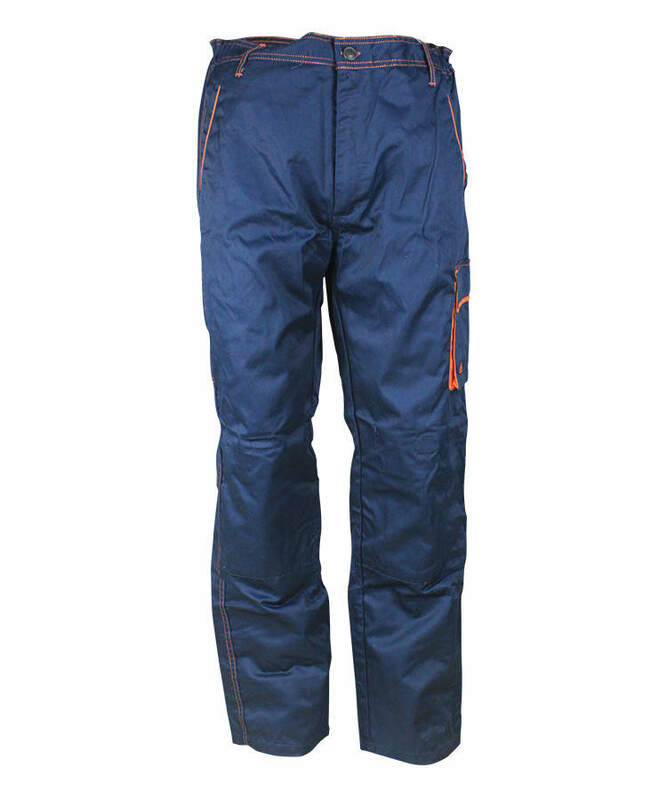 Back leg joint with contrast color, one the joint hi vis pants of flap there is reflective strip. 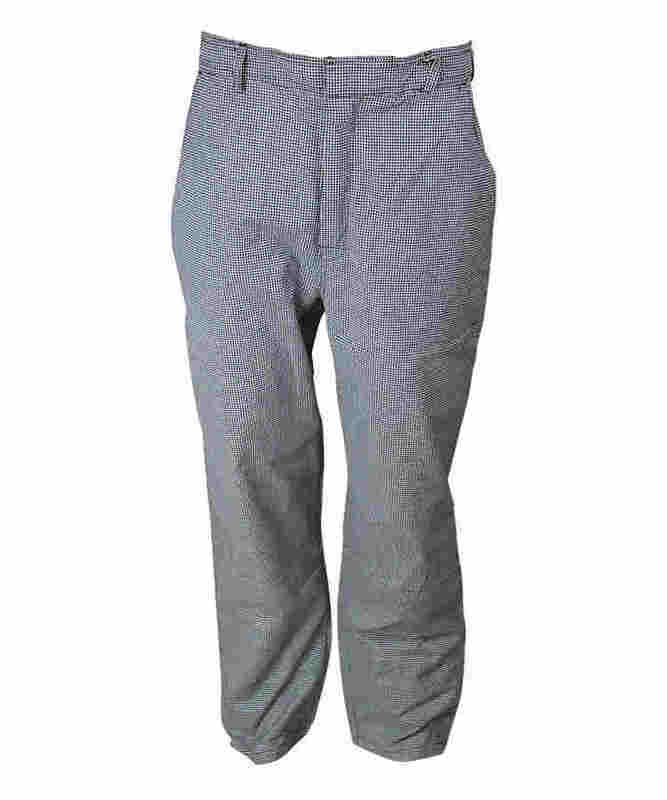 Seven loops on waist, waist head closed by jeans button. 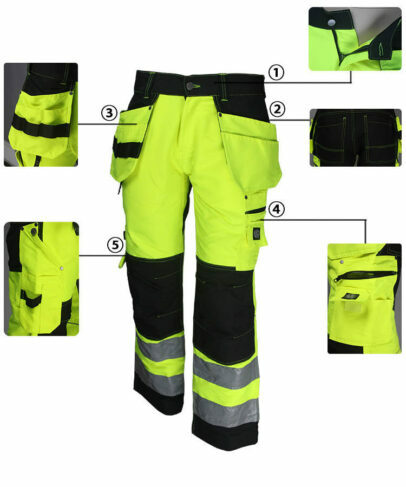 All the strength point fixed by bar tack ,this hi vis yellow pants have many pockets, suitable for workers who work outdoor.